It's good to hear (courtesy of Declan Burke at Crime Always Pays) that the film adapted from Arnaldur Indridason Icelandic noir police-procedural novel Jar City is getting some theatrical distribution. It ran on the Sundance Channel cable TV network in the U.S., as a consequence of its success on the festival circuit, but more people deserve to see it (I reviewed it here on March 8th of this year). It does stay fairly close to the novel in outline, but its biggest strength as a movie is the director's total control over not only the scenario and actors but also the color and sound. It's a very bleak setting: this is not a tourist's view of Iceland, it's the underside and the underside of a very cold place. Perhaps the closest relative, in film terms, is some of Aki Kaurismäki's early films based in Finland. 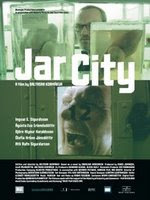 But as a pure crime story, Jar City (released on the Sundance Channel under its original Icelandic title, Myrin). The director, Baltasar Kormákur, had previously done a crime story that updates James M. Cain in interesting ways: A Little Trip to Heaven is a tour de force for actor Forest Whitaker, but also a bleak tale of violence at the fringes of Canadian society (significantly, the film is like Jar City set in a very cold climate--perhaps a key element of the director's filmic world view). A Little Trip to Heaven, which is easier to find than Jar City, deals with an insurance adjustor's investigation of a death that at first looks like a traffic accident and later turns into a murder case that subsumes everyone involved. With significant overtones of Double Indemnity, Kormákur carefully makes his own mark in the differences from that noir standard of film and fiction. The relationship between the insurance adjustor and the woman in the case is obliquely similar to the Cain story, but in a bleaker and edgier direction. And, as in Jar City, the tale is told laconically, without spoon-feading the audience. But unlike Jar City, taken from a novel in a crime fiction series, the ending of A Little Trip to Heaven is more about an existential theme in the story than the resolution of a crime (the twists and turns of the crime having been made clear just before the end). Jar City was a bit more to my taste, but if you like the backwoods noir of Cain or, more recently, Daniel Woodrell, A Little Trip to Heaven is a pure example of the genre, with added philosophical ambitions, textural design and direction by the filmmaker, and some excellent performances.